Open daily: 9:00 am to 5:00 pm. The Sandakan Memorial Park commemorates a tragedy and an atrocity that happened during the Second World War (1942 to 1945). Where more than 2,400 prisoners-of-war consisting mainly Australian and British had perished under the brutal handling of the Japanese Imperial Army. After the war a group of committed people together with the Sabah government set up this memorial park to dedicate it to the prisoners-of-war and the soldiers who had served in the British Colonial Forces. Local civilians who had assisted the prisoners in many dangerous circumstances were also remembered here. The Memorial Park is also the place where the infamous death marches to Ranau began in 1945. The Memorial Park which encompasses an area of 11 hectares is situated on the former site of the Prisoner-Of-War camp. During the war time the Prisoner-Of-War camp was much larger, about four times the present size. Many areas of the prison camp have been developed into housing estates, and today one can see that the Memorial Park is surrounded by residential units. 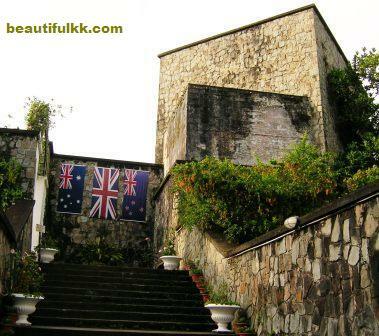 Located at the foothill of Mt.Kinabalu, and just a short distance from the Kundasang food and vegetable market, lies this mysterious fort called the Kundansang War Memorial. Kundasang is a small town on the edge of the Mt. Kinabalu National Park, about 70km from Kota Kinabalu City. Because of its temperate climate, Kundasang is famous for its vegetables, and there are numerous resorts and lodges that dot around the hill slopes. These resorts and lodges are great for holiday getaway and most of them command a great view of Mt. Kinabalu.